Q: How do I reset the earbuds when the touchpad is unresponsive or the earbuds do not work properly? A: If the touchpad becomes unresponsive or the earbuds do not work properly, reset the earbuds by pressing the Power button. 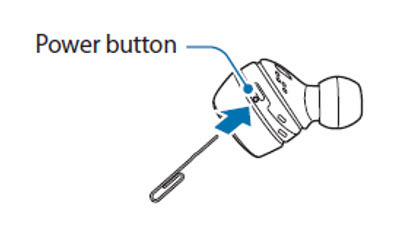 1 Remove the wingtip from an earbud. Then, use a paper clip to press and hold the Power button above the earbuds for more than 10 seconds. The earbuds will be deactivated. 2 Follow the same procedure for the other earbud to turn it off. 3 Press and hold the Power button again. The earbud will restart after the sensor indicator light flashes three times. 4 Follow the same procedure for the other earbud to restart it.